Think of your favorite coming of age "kids in peril" movies of your youth. Goonies, Monster Squad, or even Stand By Me all had distinct characters, relatable or funny personalities that helped carry their memorable adventures and were seared in your mind. Paper Girls #1 has that kind of power, innocent with a sense of adventure in a brand new series that has all the makings of a classic. It's not surprising either considering the heavyweight talent behind this beautiful and engrossing story. Brian K. Vaughan has a way of creating instantly endearing characters that are birthed whole with individual voices, attitudes, and viewpoints. We first meet Erin in mid-dream. A strange and vivid dream that could prove to be foreboding. It's November 1, 1988, and Erin has work to do. She's got a paper route to complete just before dawn. 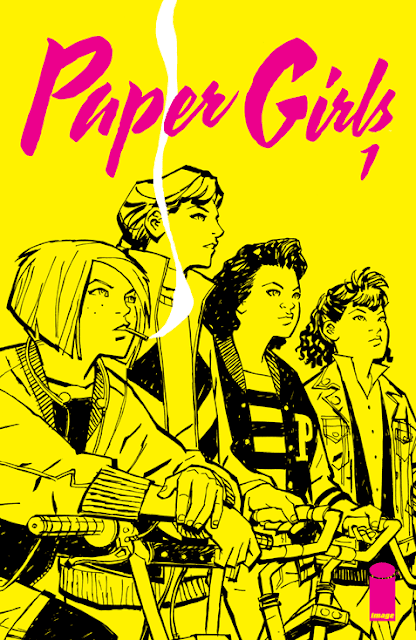 It's not just an exercise in nostalgia, although the 80's are well represented in so much background detail especially one poster of the aforementioned Monster Squad in Erin's room, Paper Girls perfectly showcases a time when a group of girls could meet on their bikes and do their route free from today's much more cautious atmosphere. It allows Vaughan to explore this sleepy suburban community in Ohio with the freedom to find some early morning strangeness. And strange is found quickly. Some teens bully Erin but Mac, KJ, and Tiffany quickly descend on the scene. In a matter of panels their personalities, bravado and cohesiveness are fully on display. Mac stands out for her no-nonsense and aggressive demeanor. The other girls aren't pushovers but Mac is clearly not to be trifled with. They decide to finish the route in groups and a friendship is born. Cliff Chiang unsurprisingly creates fantastic character designs that are uniquely defined and fleshed out in almost three-dimensional ways. The varied hairstyles, the individual clothing, freckles, a dangling cigarette and all the beautifully rendered backgrounds transports the reader into the story. When things get weird and suspenseful Chiang creates great tension with a surprising reveal. If anyone says colorists aren't storytellers hasn't seen the transformative work of Matt Wilson. Can you imagine The Wicked and The Devine without his vibrant colors? In Paper Girls Wilson is the arbiter of time and space. It's quite literal in the opening dream sequence that takes place in space, but the rich bold colors heighten the action and the senses. Back in reality, the turning of dusk to dawn is gradually reflected in the shadows, the tone of the scenes, and especially the skies. Paper Girls is the culmination of three master craftsmen at the height of their talents telling a character-driven story with unexpected twists. This oversized first issue is a bargain at twice the price. The series defies usual comic book conventions with no capes in sight or category to fit them in. It's simply a good tale told with perfection. With issue one, Vaughan, Chiang, and Wilson have conjured up a story that can go anywhere with characters that matter in a beautifully organic way. If this doesn't describe a classic in the making I don't know what does.